"Arcadians were the most common jumpships during the Golden Age, used for both terrestrial and planetary excursions. Their remains have been reported around most Earth-based space ports." 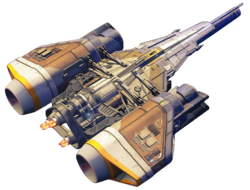 The Arcadia-class Jumpship is the first ship that new Guardians obtain. It requires an NLS Drive in Story mission Restoration to breach the atmosphere. During the Red War, the Arcadia jumpships were used, actively engaging Red Legion Harvesters and Threshers during both the attack on the City, and the counter-attack headed by the Vanguard. Throughout their service with the Guardians, the Arcadia has been seen in the hands of various owners such as Lord Saladin, Commander Zavala, and Ikora Rey, all with their own personal touches. At least one model of the jumpship has been modified by SIVA. The personal Arcadia-class ship of Cayde-6 was recreated by Amanda Holliday following his death and was obtainable by Guardians that preordered Forsaken. The Arcadia-class jumpship in flight. The Arcadia-class jumpship when first found. Once and Future, the personal jumpship of Lord Saladin and available to Guardians through the Rise of Iron record book. Nanophoenix, an Arcadia modified by SIVA. Obtained as a random drop after completing the Wrath of the Machine Raid on Heroic difficulty. Ikora Rey's personalized Arcadia. Available through Luminous Engrams from Eververse during Season 2 of Destiny 2. Commander Zavala's personalized Arcadia. Available after reaching Rank 50 with the Vanguard during Season 3 of Destiny 2.